If I had to choose a favorite fabric (although I’m not sure what the circumstances would be in which I had to make a decision of this magnitude) it would be denim, hands down. Jeans can be polished and professional, or laid back and comfy – in my opinion, they’re the best pants to live in! But what happens when your jeans aren’t wearable anymore and can’t be donated? If you’re saying, “throw them away”, then you seriously need to take a look at these 21 DIY projects that you can make with your old jeans! Step away from that trash can, immediately. For a fun, bohemian DIY, weave strips of denim together for a ragged makeshift rug that will pop in any room. What a cute baby shower gift this would be! Fancy up a baby’s bib with a touch of jean. Your jeans can hold a lot more than you thought in this DIY denim bag. Choose some fun handles and make your very own purse! For some effortless cool, use your leftover denim to make a pillow cover – it’s a neutral so it will go with any room decor. A fun toy for kids or a cool prop for decorating your home, this homemade plush whale is perfectly adorable. Boring wire pencil or makeup holder? 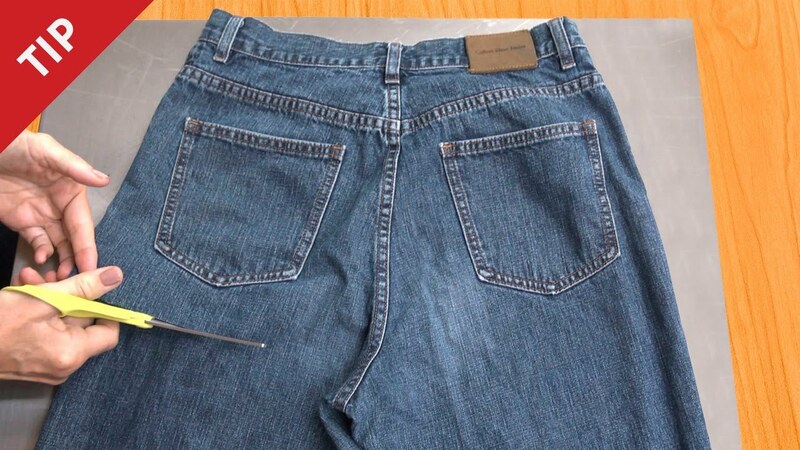 Liven it up with this simple denim DIY! To make some extra storage space that’s as pretty as it is useful, use strips of denim to weave your very own jean basket. Pack lunch in style! These jean lunch bags are not only adorable for your kids to bring to school (or for you to bring to work), but they’re reusable – no more wasting money on paper bags. If you’re looking for double style points, this reversible tote is just the thing. With a cute pattern on the inside and a cool denim exterior, this tote can change with your mood or outfit! Nothing is more relaxing than kicking back onto a comfy ottoman. For comfort AND style, use patches of old denim to make your own, personalized pouf. Because denim as a fabric is so thick and durable, it’s perfect for the job of a pot holder! This DIY denim map would look awesome in any home. Choose some rustic pallets for the backdrop and then cut your old jeans into whatever shape you’d like – don’t limit yourself to just maps, get creative! Perfect for summer barbecues, these denim placemats are easy to make and look so cute. Make a fashion statement with a DIY denim headband! Denim seat cushions are a simple and easy way to liven up a boring dining room table set. For extra fun, paint or stitch something on to each seat cushion. This fun DIY decoration screams summertime! Make the most out of your old jean pockets by turning them into a multi-functional garland. Feeling artistic? Denim is a great new medium to try! Make something beautiful with your old jeans to hang proudly in your home (and then make up a fancy name every time someone asks you who created it). So maybe you can’t wear your jeans anymore, but your soda cans definitely can! These cute little cozies are easy to make and perfect for the warmer months. The perfect apron to catch stains while still looking fabulous! Make smaller aprons out of petite jeans for the kids, too. For your adorable accessories, you’ll need an adorable place to keep them. These jazzed up little jean bags are the perfect place to keep your jewels in style. Although this craft is a little more intense than a small purse or tote, this jean gym bag is well worth the effort! Sweat in style with this roomy, DIY bag. Have you ever done any fun crafts with your old jeans? Share them in the comments section below!